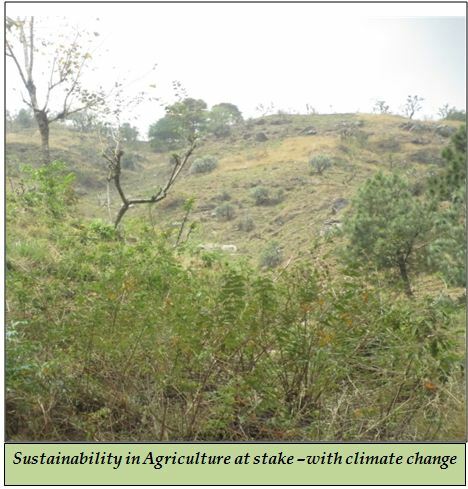 Sustainability in Agriculture is the major concern in recent time. Why Sustainability in Agriculture has started attracting our attention? There was a time when profitability was the main concern irrespective of long term sustainability. by having an added learning through various agriculture and water based project’s interventions, now started facing problems. Farmers are finding difficult to adjust their sowing time with their ongoing cropping system.Though they are having a profitable cropping system but the farmers have fear in their mind of how long they can sustain this way.The standing crops are being damaged by the intensive heat or unexpected rain fall. The crops are failing to complete its growth and development to reach its maturity. Such is the scenario with most of Agri- based crops .Farmers has agriculture as the base for their livelihood. Their livelihood base is in danger. Prevailing Circumstances are making them bound to think that the profitability in short term can’t fulfill their sustainability production parameter.